The efficient management of nutrients on dairy farms is an important factor to ensuring that the industry reduces environmental risk whilst increasing production. It is currently perceived that many soils under intensive grazing pastures are either deficient in critical nutrients or have nutrient levels above optimum for pasture production. It is thought that some farmers fail to conduct regular soil tests. Variations and in some cases excessive soil nutrient values are supported by research in the dairy industry, where the levels of phosphorus (P), potassium (K) and sulphur (S) can be above the optimum levels for pasture growth (Burkitt and Coad, 2006; Gourley et al., 2010). 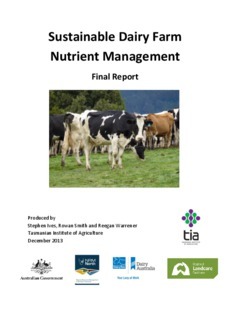 This study sought to evaluate the nutrient status of each paddock used for milk production on twenty dairy farms in the Brid and Meander catchments in Northern Tasmania, and use the results to develop whole farm nutrient budgets and nutrient distribution maps for pH, Olsen P, Colwell K and Sulphate S. The main objective was to assist farmers and land managers to identify base level nutrient deficiencies or excesses for targeted nutrient re-distribution and/or additions. Information was collected from farmers relative to nutrient export and import including the number of livestock, live weight gain of animals sold off the farm, annual milk production, grain and fodder and applied inorganic fertilisers. This was then used to develop nutrient budgets with the Nutrimatch programme (developed by DPI, Victoria). Effluent from the milking sheds on all the dairy farms was retained on site, so the nutrients lost or gained were not considered in the whole farm budget as part of this project. It is anticipated that as a result of project deliverables, farmers may demonstrate behavioural adaptability from improved awareness and willingness to undertake changes on their farm with regard to nutrient management and sustainable fertiliser use. The trial has also highlighted the importance of strategic soil testing to better target fertiliser applications and reduce the environmental risk that intensive grazing systems may pose to water and soil quality. Furthermore, the project has added to the data collected on previous dairy pastures and provided researchers and the dairy industry a better understanding of the nutrient condition of intensive grazing pastures used for milk production.